Flood Panel is a solid removable flood barrier system ideal for single or double door applications. It is engineered to withstand hurricane forces and floodwater hydrostatic impacts. Each panel is specifically engineered to the full “designed flood elevation” (height required), and is edged with a rubber gasket. 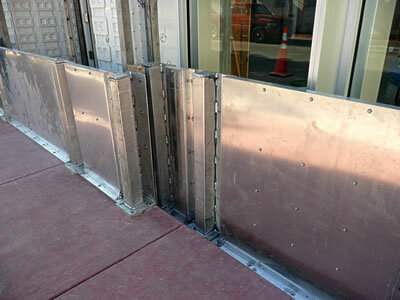 The panels themselves are connected to the floor and sides of each opening or each other by preinstalled anchors and through-bolts. 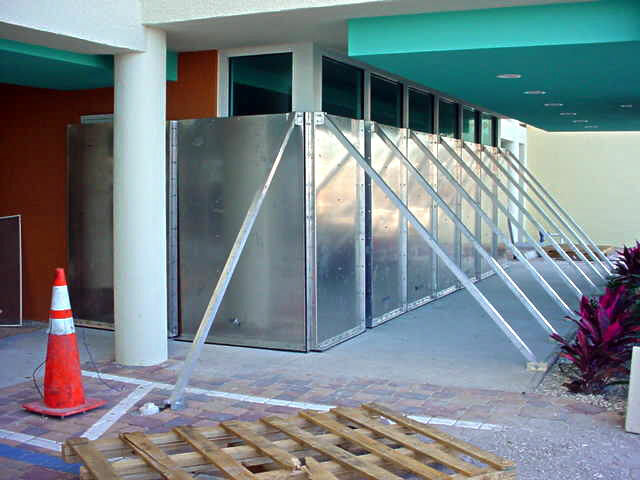 Panels with a span greater than 4 feet can be supported by either a 45-degree brace or a Mid-Span Support Post®, a proprietary design of Flood Panel, if necessary. Design heights can range from from 12 inches to over 7 feet. Custom designs are available that include large panels with no braces. Standard Flood Panel installation. Please click image to enlarge. Flood Panel installation at the Miami Beach Multi-Purpose Parking Garage, Miami Beach, Florida. Please click image to enlarge. 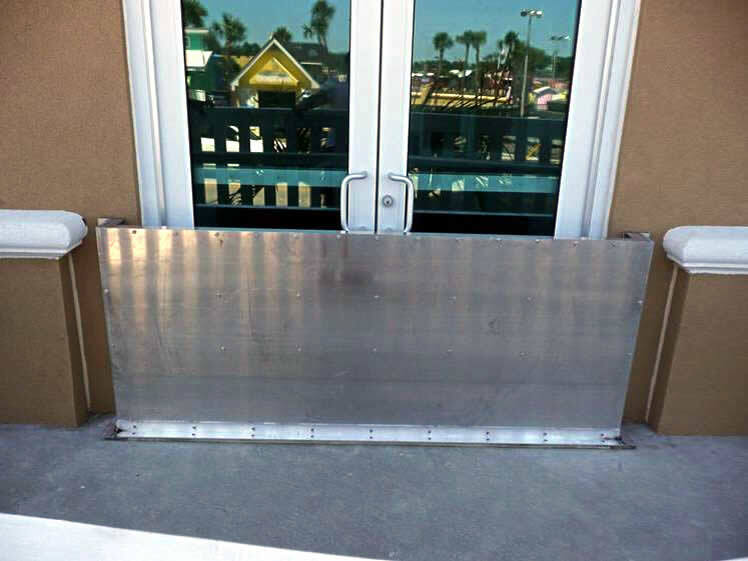 Custom Flood Panel installed at the Westgate Resort in Myrtle Beach, South Carolina. Please click image to enlarge. 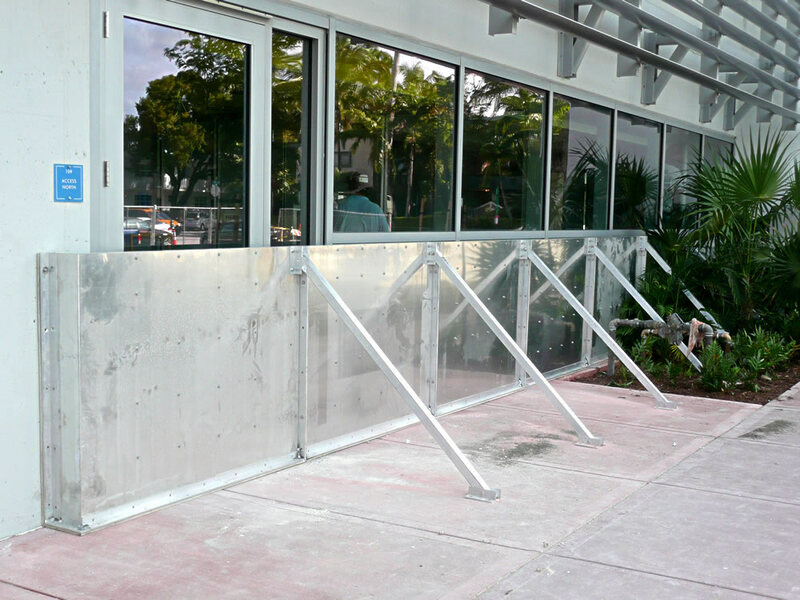 Custom Flood Panel installed at the Armani Exchange located in Miami Beach, Florida. Please click image to enlarge.